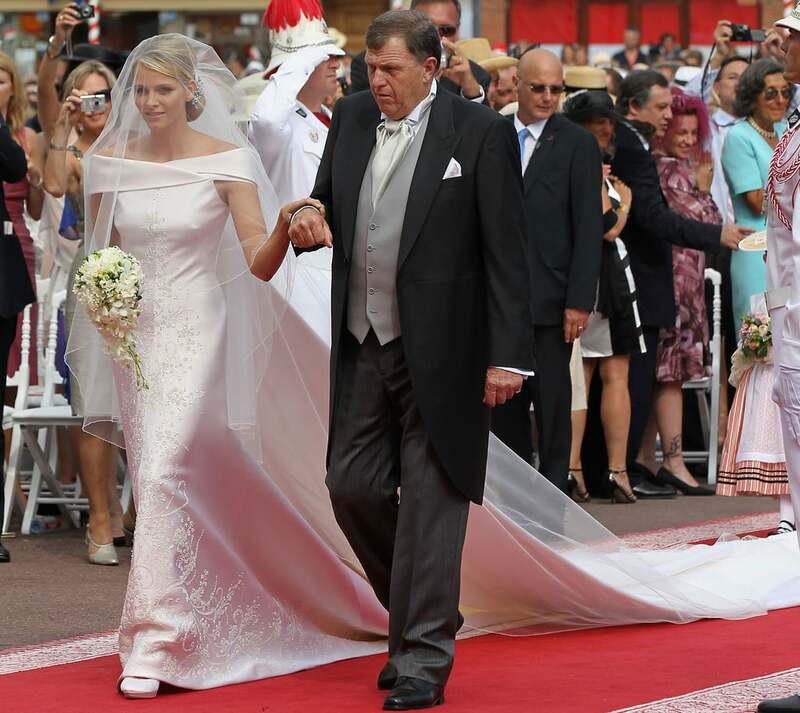 Last Friday, all of Monaco (and Europe) watched as in a matter of seconds Miss Charlene Wittstock became a Princess when she wed Prince Albert II. Royal Wedding Wednesday Prince Albert and Princess Charlene. The short civil ceremony was attended by 80 close friends and family members in the throne room. Making an appearance on the balcony with the happy couple were the witnesses. Mrs. Donatella Knecht de Massy is the wife of Sebastien de Massy, Prince Albert’s first cousin once removed and grandson of Princess Antoinette of Monaco. Mr. Chris Le Vine is Prince Albert’s cousin. His mother, Lizanne Le Vine, was Princess Grace’s sister. The bride wore a pale blue jacket and palazzo pants of her own design which was created by Chanel. It was embellished with pearl and rhinestone buttons. Her hair was swept into a simple chignon and her makeup light. Simple diamond earrings graced the bride’s ears. The jacket was later removed for the evening festivities. The strapless corset was made of delicate silk lace and the silk organza palazzo pants featured numerous pleats. She added a statement piece necklace to the ensemble. The day of the religious ceremony dawned clear, lovely and hot at the Place de Palais. All of Monaco was festooned with beautiful flowers as well as the flag of Monaco and South Africa, a nod to the bride’s heritage. The invited guests began arriving two hours prior to the event. They included Prince Edward and his wife Sophie, Countess of Wessex, who represented Britain’s House of Windsor. I have a feeling that the new Princess is going to age very gracefully. This is the lovely mother of the bride, Lynette Wittstock, accompanied by her two sons, Sean and Gareth. From the groom’s side of the family, Princess Stephanie and her three children, Louis, Pauline, and Camille. Princess Caroline wore Chanel couture, she was accompanied by her youngest daughter, Princess Alexandra. Her eldest daughter, Charlotte, also in Chanel, is a truly lovely young lady. The radiant bride soon emerged on the arm of her father, Michael Wittstock. The Ballets de Monte-Carlo and Jean-Christophe Maillot, director of the ballet, designed and created the young maid’s traditional 18th-century attire. The silk stockings worn by the girls were embroidered with the couple’s monogram. The aprons also featured both the couple’s monogram and the name of the area of Monaco that each girl was from. This seemingly small gesture no doubt further endeared both the Prince and new Princess into the people’s hearts. Each dress took more than 120 hours to create. Prince Albert presented each little girl with a necklace of black velvet ribbon with a gold cross. I have to let you in on a secret, as soon as I saw these darling wee lasses I was smitten and could barely keep my eyes on the bride. They reminded me of Marie Antoinette at the Petit Hameau. But then I viewed a close up of the bride’s bouquet and spied the magnificent hairpiece nestled into her chignon and my attention was once again captured. The 19th-century hairpiece once belonged to Prince Albert’s grandmother and was the “something borrowed” from the bride’s sister in law, Princess Caroline. It is a convertible piece of jewelry that can also be worn as two broaches. The layered veil was made from of over 65 feet of silk tulle. Perfection! The off-the-shoulder dress was designed and created Armani Privé. Two gowns were created in the event of an emergency. The dress took three seamstresses 2,500 hours to make and was adorned with 40,000 Swarovski crystals, 20,000 mother-of-pearl teardrops and 30,000 stones in gold shades in a floral pattern enhanced with platinum covered thread embroidery. The gown required over 164 feet of Duchesse silk and over 262 feet of silk organza. The skirt flowed into a train and was topped by a longer 16 foot “à l’andrienne” train attached just under the crossed over backline of the dress. Prince Albert II entered into the palace courtyard which had been transformed into an open air cathedral. Prince Albert wore the cream summer uniform of the Carabiniers, Monaco’s palace guards. His sleeves and epaulets were embroidered with gold oak and olive leaves. Gold buttons featured the Prince’s monogram. The medals worn on the jacket included the Order of Saint Charles, the Order of Grimaldi, and the French Legion of Honor. He was soon met at the base of the marble steps by his beautiful bride. The ceremony was a 90 minute full traditional Catholic Mass. Although most of the ceremony was conducted in French, a few readings were given in English and Afrikaans (one of the native languages of South Africa). The couple has a moment of prayer. They were joined at the altar by their witnesses, Mr. Le Vine and Mrs. de Massy. The couple exchanged 18-carat white gold platinum rings by Cartier. A variety of readings were given throughout the ceremony and various music was performed by The Philharmonic Orchestra of Monaco and the Choir of the Opera of Monte-Carlo, Renée Fleming, soprano, Pumeza Matshikiza, soprano, Juan Diego Flórez, tenor. The quartet of soloists for the elements of the mass composed by Mozart was made up of Lisa Larsson, soprano, Wiebke Lehmkuhl, alto, Kenneth Tarver, tenor and Alexander Vinogradov, basso. The Choir of the Cathedral of Monaco and the Little Singers of Monaco (founded originally by Prince Rainier) were under the direction of Pierre Debat, the Chapel Master of the Cathedral of Monaco and of the Prince’s Palace. The Grand Organ was played by Olivier Vernet, lead organist at the Cathedral of Monaco. The Choir Organ was played by Jean-Cyrille Gandillet. My favorite portion of the musical program was “Ave Maria” sung by Andrea Bocelli. While I had wondered if the hairpiece was indeed real diamonds, once they were uncovered and able to sparkle in the sunshine it was no longer a question. Here is a close up of the matron of honor Donatella Knecht de Massy in a pale seafoam dress. Princess Charlene’s other matron of honor was Danish designer Isabell Kristensen seen holding her train. As Princess Charlene had two trains, both lovely ladies were needed. Princess Charlene left it up to her friends to decide what they wanted to wear. The bride’s upper 16-foot train was removed during the signing of the registry revealing a row of covered buttons. This image provides a wonderful close up of the intricate embroidery of the brides gown as well as the grooms uniform and his various medals. The Prince and his new bride drove through the streets of Monaco in a customized electric Lexus LS 600h landaulet (the top which is a convertible behind the driver). The couple traveled to Saint Dévote Church so that the Princess could leave her wedding bouquet on the altar of the Virgin just as Princess Grace did over 55 years ago. The bouquet was designed by Armani and created by the gardeners of the Prince’s Palace. It was composed of freesias, dendrobium orchids and lilies of the valley. During the short ceremony, the bride was moved to tears as Mrs. Marie-Clotilde Würz-De Baets and her 11-year old daughter Miss Juliette de Baets performed a song. The couple then returned to the palace for the official wedding portraits. This image contained all of the visiting Royalty from various countries. After a few hours rest, the couple traveled to the Opera Garnier in Monaco for the wedding dinner and ball. The dinner was on the open terraces with the bridal party seated in the center. The bride changed into an Armani Privé evening gown in off-white silk chiffon. The gown had rounded neckline, four-tiered skirt and was embellished with graduated embroidery crafted with Swarovski teardrops and stones in gold and platinum colors. All of the wedding guests were invited. Both the Prince’s sisters changed into evening gowns. Princess Caroline once again wore Chanel and transformed a diamond and sapphire necklace into a tiara. Princess Caroline’s eldest children: Pierre Casiraghi on the left and Andrea Casiraghi on the right. Charlotte Casiraghi would have made her grandmother, Princess Grace, proud. 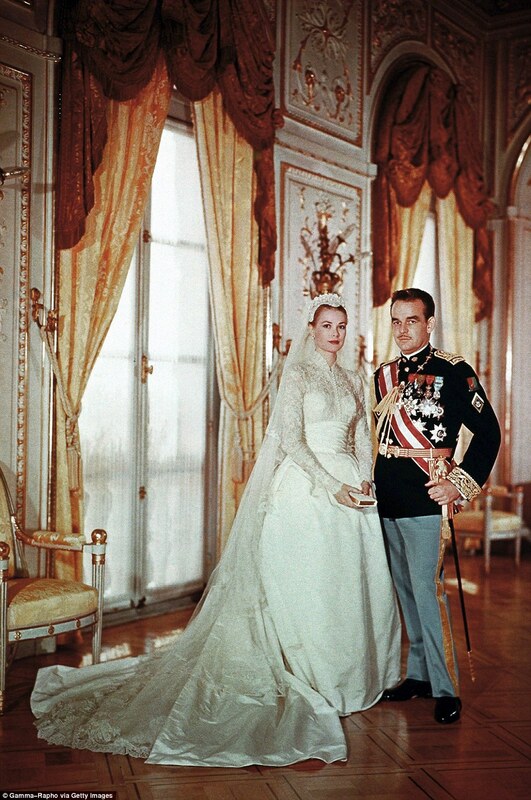 Her powder blue Giambattista Valli gown and cape reminded me of two of the gowns worn by Grace Kelly in “To Catch a Thief” which I talked about HERE. The five-tiered cake was decorated with Proteas, South Africa’s national flower. I spied Princess Charlene’s wedding gift from her groom, the Ocean convertible necklace and tiara (worn in her hair) from Van Cleef & Arpels. All of Monaco enjoyed a spectacular fireworks show. The newlyweds shared a quiet moment in the garden. « Monaco Has a New Princess! Beautiful wedding. Like a fairy tale. It was such a beautiful wedding. 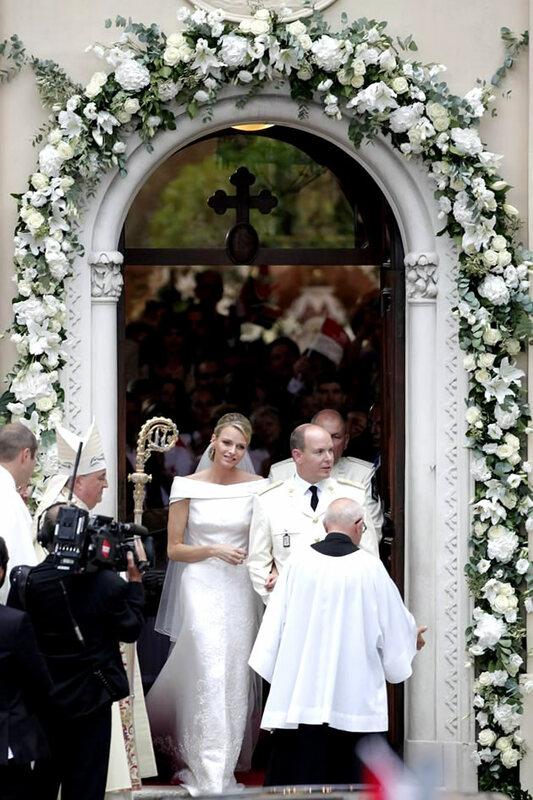 I loved the Princess's outfit for the civil ceremony, and her dress for the religious ceremony was stunning. She looked just as a princess should. Loved the hairpiece. Wonderful pictures! Thanks for sharing. Love Charlotte's pale blue dress! Your photo's were placed perfectly and it was just like being there. I know how much time and work you put into this blog post – excellent! – thank you. That's a wedding to adore. Best recap I've seen. It is a shame the US media didn't cover the wedding as they did Prince William and Kate's. Thank you for posting and sharing all these lovely photos. Unfortunately Prince Albert's toast was….awkward to say the least. But Charlene's dresses were quite lovely…..Charlene is quite lovely….and the whole affair looked fairytale perfect. Wishing you a beautiful day…. almost as exciting as being there in person! merci for sharing the wonderful details of this truly lovely, royal event! I actually like princess Charlene's evening dress better than her wedding dress (except for that stunning hairpiece and veil)- is that terrible? And those little girls…like perfect pink candy. One more thing…these two were at the Duke's and the Duchess's wedding, right? But I gather that William and Kate weren't at theirs, any particular reason? Thank you so very much for all the time you spent writing and arranging this. The views and pictures are better than if I'd been there, they're so close up. I loved seeing all the details of the dresses, the veil, the Rainier family, etc. The videos are a real treat. I was struck by Charlotte's pensive expression during Ave Maria, wondering what was going through her mind and if she had a sense of how her life was going to change,,, In those moments (as always) her beauty was breathtaking. Thank you, thank you. PS I was particularly interested in seeing how her palazzo pants were pleated at the top when she took her jacket after from the civil ceremony. That suit was beautiful but I was really surprised when I saw her walking in it and noticed that they were palazzos. Gorgeous color on her. What a stunning wedding! Breathtaking…Very beautiful blog. Such lovely photos too! Thank you for all your time in researching and for another lovely RWT post. My Wednesday is complete! Thank you Laura for this post. I wasn't able to see the wedding and so it was wonderful reading all the details!! Another lovely and informative post. Thank you for sharing all of this. I feel as though I am an official wedding crasher! The bride looks like she was born to be a princess. Charlotte Casiraghi is the spitting image of her mother when she was younger. The post was definitely worth the wait. I shared it with my mother over breakfast and she got much enjoyment out of it. I watched the wedding live and then an hour later watched the “highlights” and did a post on my blog, but still couldn't wait to see what you would post. She did look amazing. I like that they held hands so often (even in the official portraits, which I don't believe the British royals have ever done). I'm not sure how I feel about the aigrette (I prefer traditional tiaras) but it's an interesting piece to say the least. Leave it to Laura to track down the info on the Bride's headpiece! I thought the little girls were just adorable! Your post is fabulous. It was as if you were there. Unbelievable. I know this took a lot of time and work. Job well done. Beautiful post! We are indeed proud of our South African Princess. Thank you Laura for your wonderful post on the Monaco wedding. We had very little coverage here and although you mentioned CNN would be covering it – I missed it. We in New Zealand are usually at least a day ahead of many countries!!! 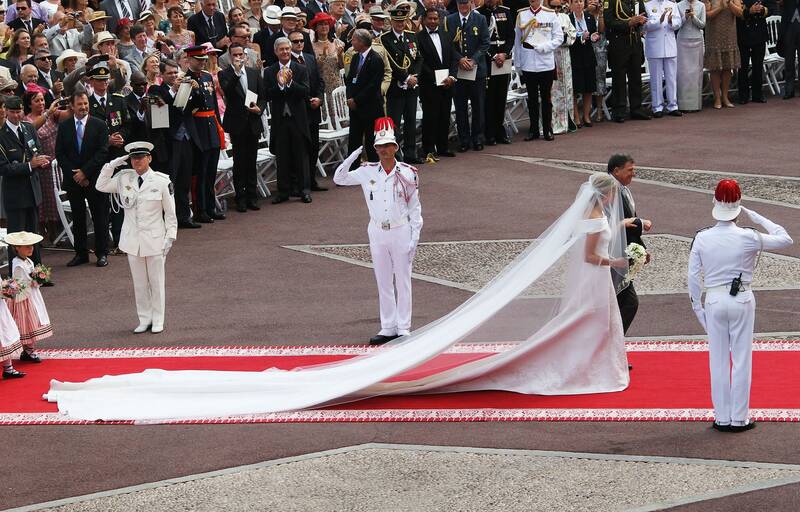 I loved every part of it – Princess Charlene's wedding gown was exquisite as was her evening dress. I know I'll be back many times to view this post! Oh My Goodness!She is a stunner! But then this whole family is gorgeous. wow, that was beautiful. Thanks for posting, that just made my day!